Digging, chewing, and scratching at doors or windows in an attempt to escape and reunite with their owner. Most Dog Don’t Suffer from True Separation Anxiety – They Just Misbehave! Separation anxiety is closer to a phobia: the dog literally panics when he is left alone. Cases of true separation anxiety are few and far between (though they do exist). A dog going home for the first time and chews on the woodwork or blinds the first time you leave isn’t displaying true, textbook separation anxiety, but the tips in this handout are nonetheless effective and helpful for teaching your dog how to be alone. We don’t fully understand why dogs suffer from separation anxiety and, under similar circumstances, others don’t. 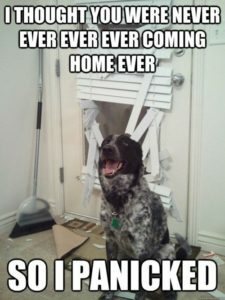 It’s important to realize, however, that the destruction and house soiling that often occur with separation anxiety are not a dog’s attempt to punish or seek revenge on his owner for leaving him alone. In reality they are a part of a panic response. When a dog accustomed to constant human interaction is left alone for the first time. After a traumatic event (from the dog’s perspective) such as a period of being in a shelter, or a boarding facility. After a change in the family’s routine or structure, such as a child leaving for college a change in work schedule, a move to a new home, or a new pet or person in the home. He reacts with excitement, depression, or anxiety to your preparations to leave the house. For a minor separation anxiety problem, the following techniques may be helpful by themselves. For more from their owners, for example, severe problems, these techniques should be used along with the desensitization process described in the next section. Keep arrivals and departures low key. For example, when you arrive home ignore your dog for the first few minutes, then calmly pet him. This may be hard for you to do, but it’s important! Leave your dog with an article of clothing that smells like you- such as a tshirt you’ve worn recently. Establish a “safety cue”- a word or action that you use everytime you leave that tells your dog you’ll be back. Dogs usually learn to associate certain cues with short absences by their owners. For example, when you take out the trash, your dog knows you come right back and doesn’t become anxious. Therefore, it’s helpful to associate a safety cue with your short-duration absences. Some examples of safety cues are playing a radio, a playing television, or a toy. Be sure to avoid presenting your dog with a safety cue when you leave for a period of time longer than he can tolerate. if you do, the value of the safety cue will be lost. Leaving a radio on to provide comfort for your dog isn’t particularly useful by itself, but a playing radio may work if you use it consistently as a safety cue in your practice sessions. If your dog engages in destructive chewing as a part of his separation distress, offering him a chewing item as a safety cue is a good idea. Hard rubber toys that can be filled with treats, like a Kong, are good choices. Begin by engaging in your normal departure activities (getting your keys, putting on your coat) then sit back down. Repeat this step until your dog shows no distress in response to your distress. Next, engage in your normal departure activities and just open the door, then sit back down. Finally, step outside, close the door, then immediately return. Slowly get the dog accustomed to being alone with the door closed between you for several seconds. Proceed very gradually from step to step, repeating eack step until your dog shows no signs of distress. The number of repetitions will vary depending on the severity of the problem. If at any time in this process your actions produce an anxiety response in your dog, you’ve preceded too fast. Return to an earlier step in the process and practice the step until the dog shows no distress response, then proceed to the next step. once your dog is tolerating your being on the other side of the door for several seconds, begin short duration This step involves giving the dog a verbal cue (IE: “I’ll be back”), leaving, and then returning within a minute. Your return must be low-key; either ignore your dog or greet him quietly and calmly. If he shows no signs of distress, repeat the exercise. Gradually increase the length of time you’re gone. Practice as many absences as possible that last less than 10 minutes. You can do many departures within one session. if your dog relaxes sufficiently between departures. You should also scatter practice departures and short-duration absences throughout the day. Once your dog can handle short absences (30-90 minutes) he’ll usually be able to handle longer intervals alone, and you won’t have to repeat this process every time you are planning a longer absence. The hard part is at the beginning, but the job gets easier as you go along. Nevertheless, you must go slowly at first. How long it takes to condition your dog to being alone depends on the severity of his problem. 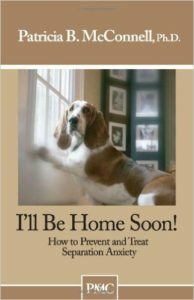 We also recommend purchasing a copy of this inexpensive book by Dr Patricia McConnell: http://www.amazon.com/Ill-Home-Soon-Separation-Anxiety/dp/1891767054/ref=sr_1_1?ie=UTF8&qid=1343361719&sr=8-1&keywords=i%27ll+be+home+soon . It is an excellent resource on working with a dog showing signs of separation anxiety. Another technique for reducing separation anxiety in your dog is practicing the “sit-stay” or “down-stay” training exercises using positive reinforcement. Your goal it to be able to move briefly out of your dog’s sight while he remains in the “stay” position and thereby teach your dog that he can remain calmly and happily in one place while you go to another. To do this, you gradually increase the distance you move away from your dog. As you progress, you can do this during the course of your normal daily activities. For example, if you’re watching television with your dog by your side and you get up for a snack, tell him to stay, and leave the room. When you come back, give him a treat or praise him quietly. Never punish your dog during these training sessions. Because the treatments described above can take a while, and because a dog with separation anxiety can do serious damage to himself or your home in the interim, consider these suggestions to help you and your dog cope in the short term. Leave your dog with a friend, family member, or neighbor. Take your dog to work with you, even for half a day if possible. Punishing your dog. Punishment is not an effective way to treat separation anxiety. In fact, punishing your dog after you return home may actually increase his separation anxiety. Getting another pet as a companion for your dog. This usually doesn’t help an anxious dog because his anxiety is the result of his separation from you, his person, not merely being alone. Crating your dog. Your dog will still engage in anxiety responses in the crate. He may urinate, defecate, howl, or even injure himself in an attempt to escape the crate. Leaving the radio on (unless the radio is used as a “safety cue” as described above). Training your dog. While formal training is always a good idea, it won’t directly help a separation anxiety problem. Separation anxiety is not the result of disobedience or lack of training, it’s a panic response. 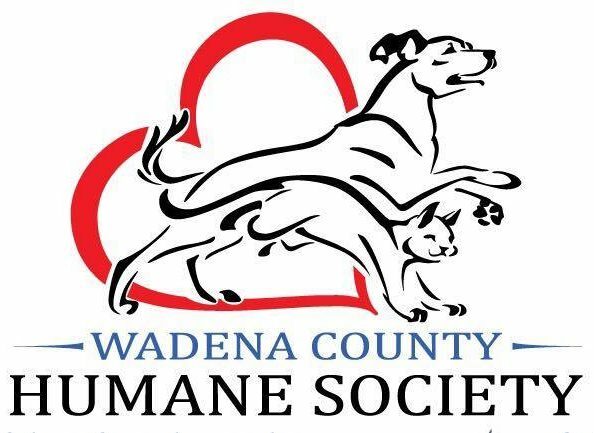 * Thank you Austin Pets Alive! Behavior Team for sharing this resource!